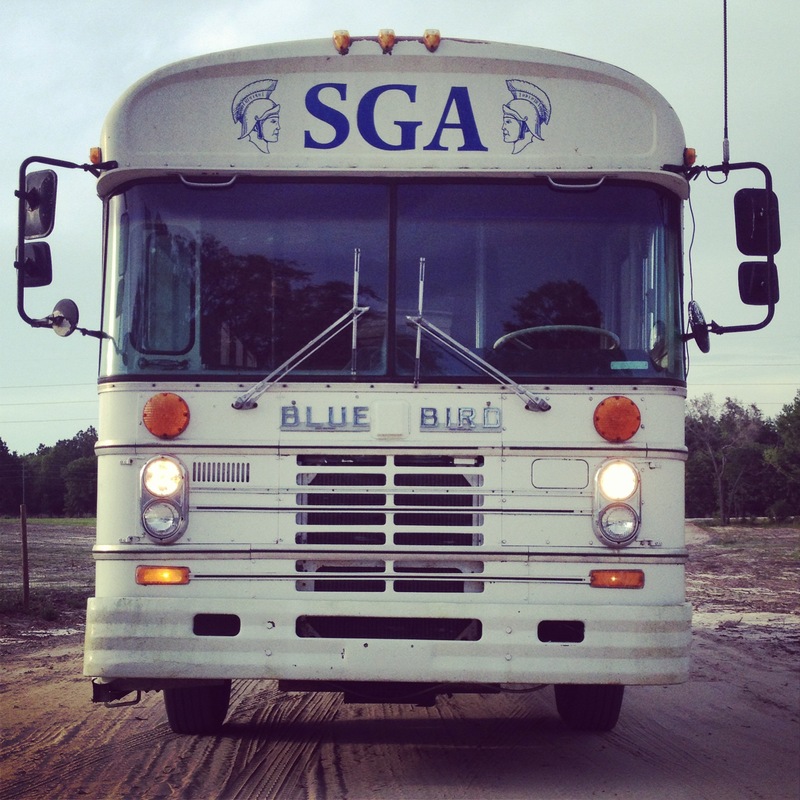 On April 5th, 2014, we brought home our 1984 Blue Bird from Damascus, Georgia. Steven’s maiden voyage was a pretty smooth 6 hours back down to central Florida. 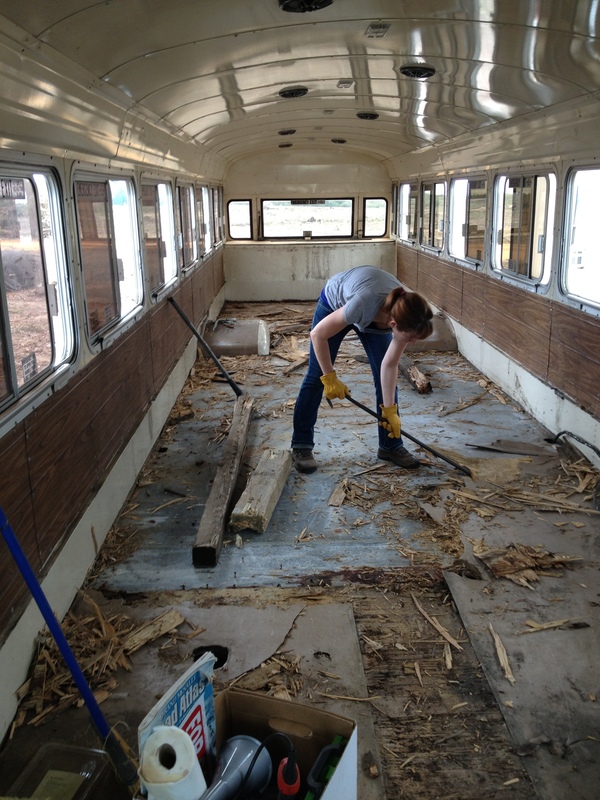 Our first task was to strip it down, and have a clean slate to build on. 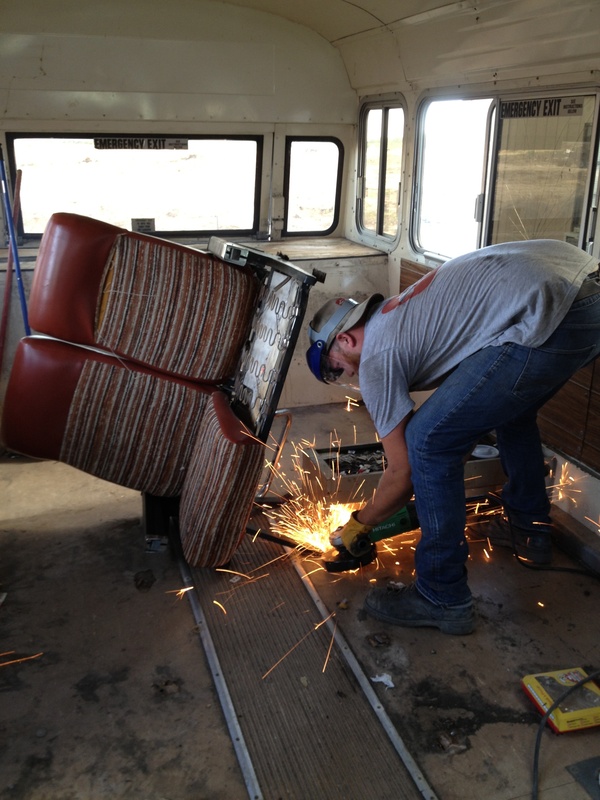 The seats were surprisingly not too hard to remove, just bulky. The floor, however, was another story. Layers of rubber flooring, half-rotten plywood, globs of glue, and half a million rusty nails and screws put up a merciless fight. We were BEYOND thrilled to see it all gone. 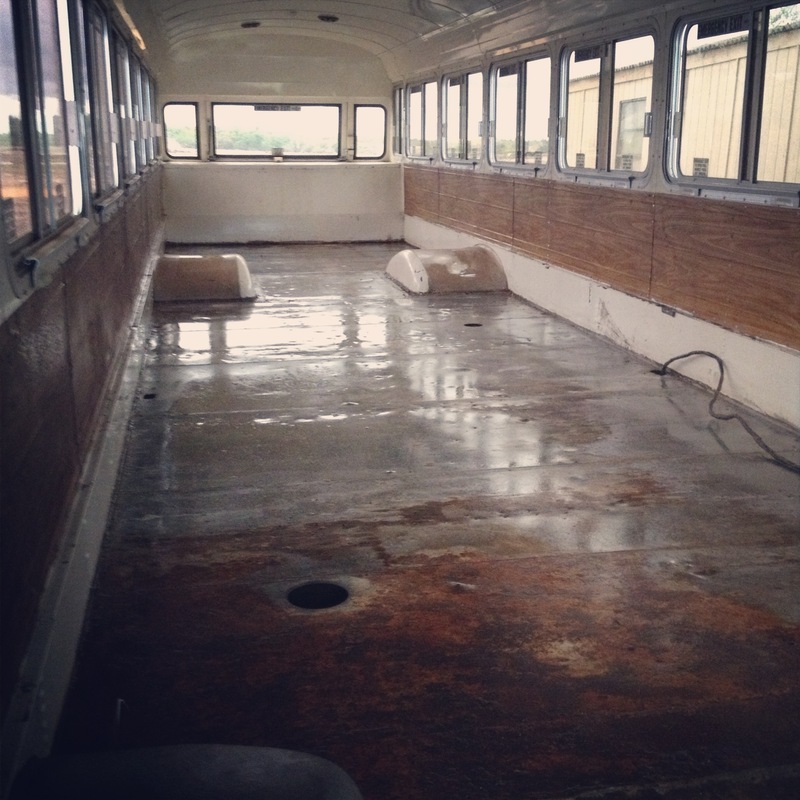 The floor got treated to Rust Stop paint, foam, and plywood, before the wood flooring went in. Construction started! 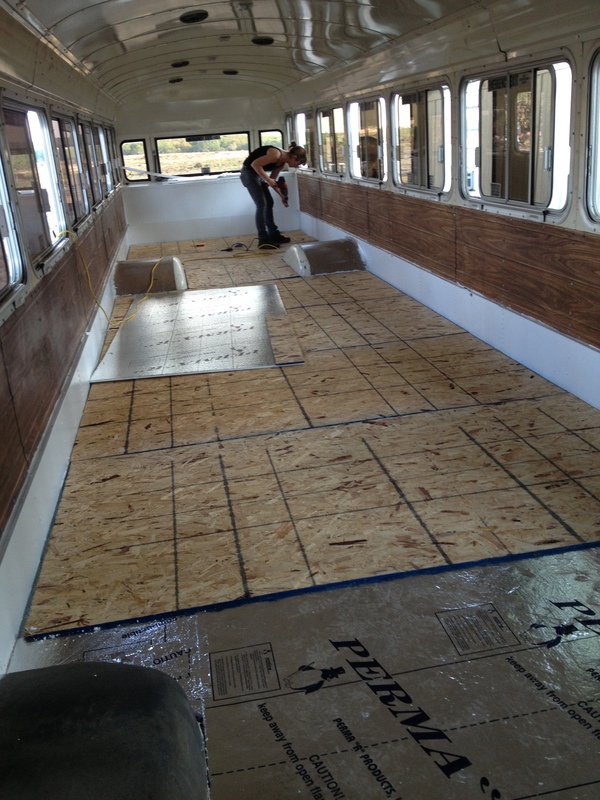 Wheel wells got boxed in, bed frame was built, and kitchen counters went up. We had actually made the kitchen counter tops ahead of time. 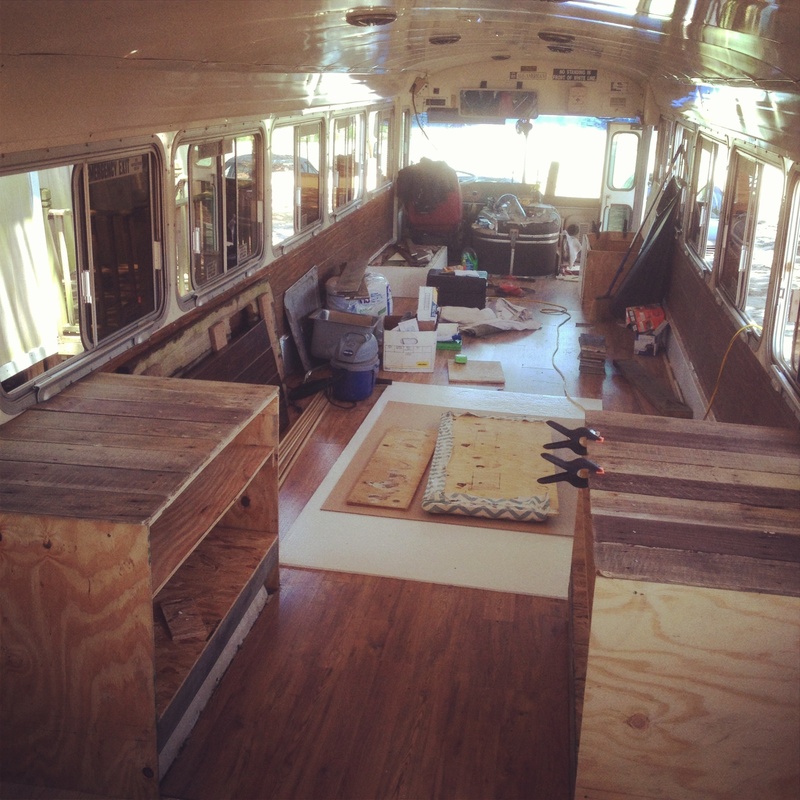 We used salvaged lumber (a.k.a. free! ), so there’s a little freeform action going on. 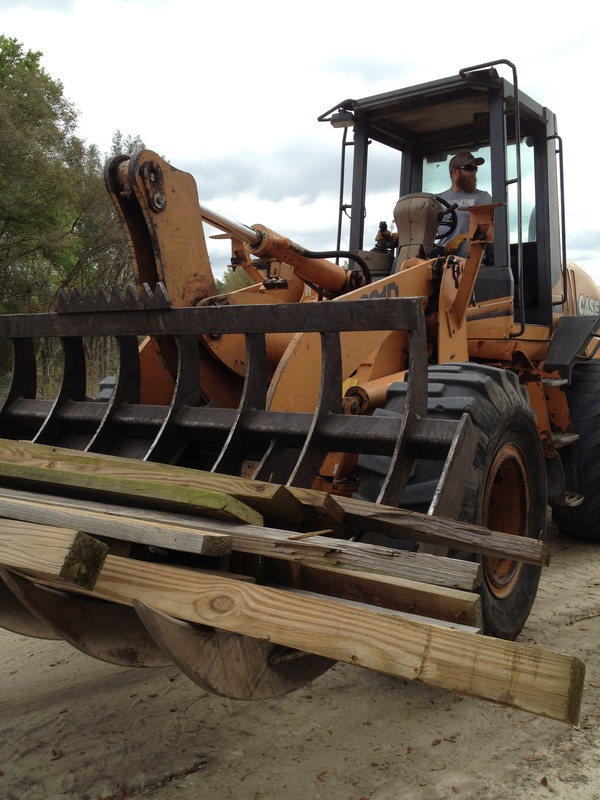 Fine with us, it gets the job done. The corrugated metal forms the bathroom walls. 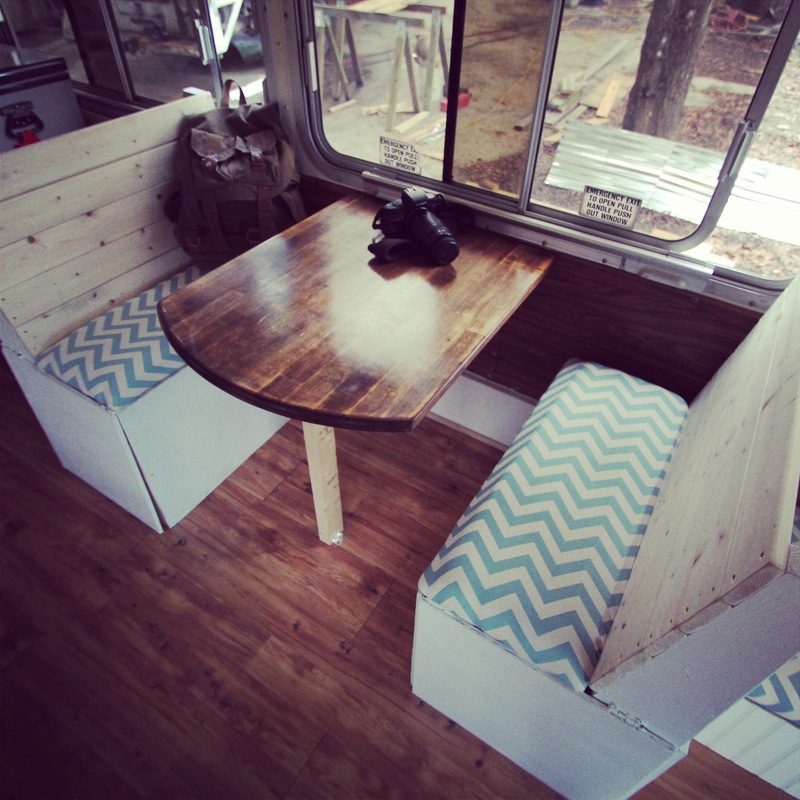 Steven built some benches with storage compartments underneath, and turned an old table into the dinette. We finally hung up our curtains. 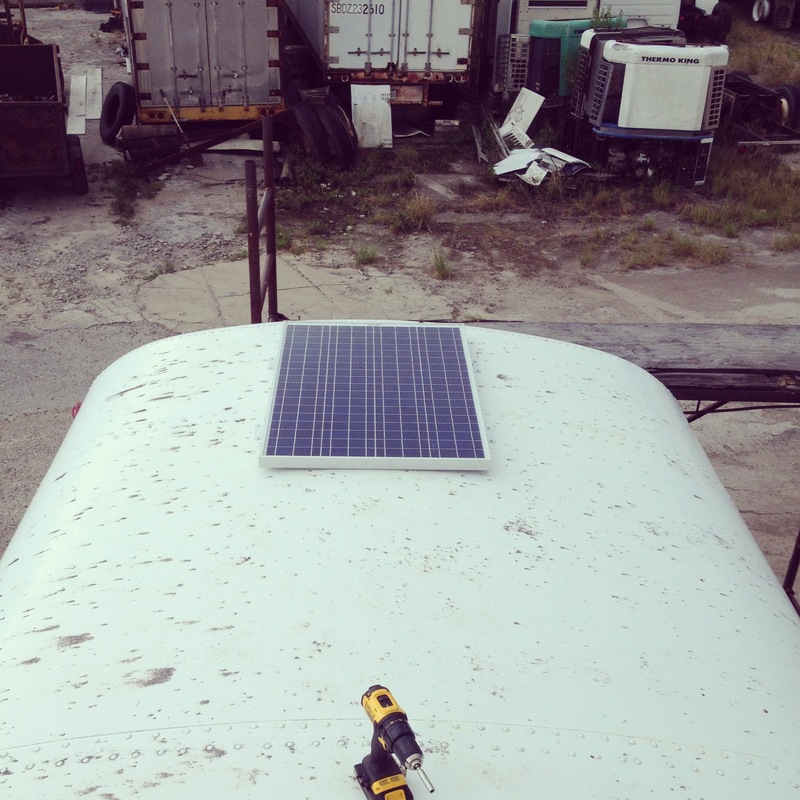 Harnessing the power of the sun! The bright blue stripe and it’s stuck-on lettering had to go. We replaced it with a metallic bronze and like the vintage look. Here is a shot of the bathroom, sans curtain. We bought this neat little Dry-Flush toilet, which is totally self contained and uses no water or chemicals. You just throw the tightly sealed contents away after 15 uses. We decided we needed another mode of transportation with us, so we bought this bike and had a custom trailer hitch built and welded onto the frame. Fresh fluids, belts and filters. A crack in the radiator was repaired, and valve replaced. The water pump caused us all the trouble because it was extremely hard to find the right one for our outdated engine. 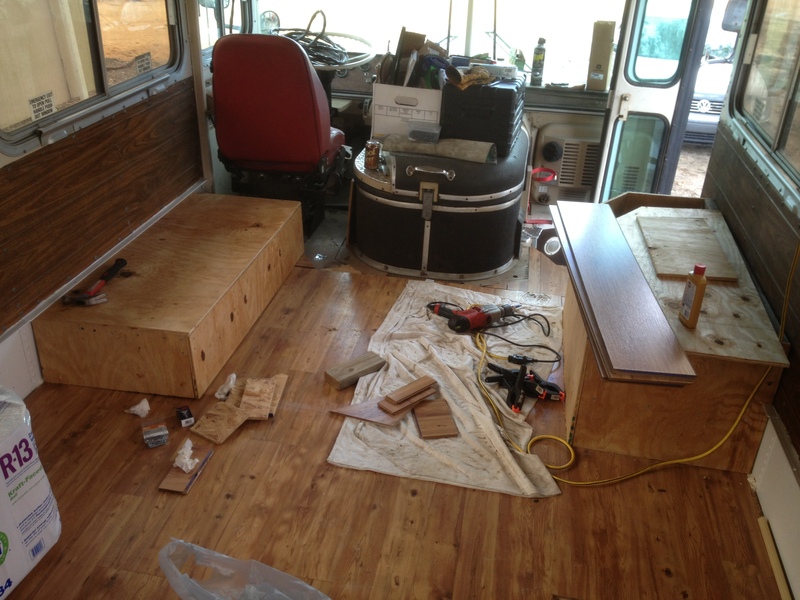 It delayed our trip by a week, but did allow us more time for finishing touches. Like your bird. I’m just about to finish mine (www.leonardsteward.com) and get back on the road September 15, 2014. I’m planning on getting the dry-flush toilet also. How’s it working out for you. Hope to meet you somewhere along the way. Thank you! 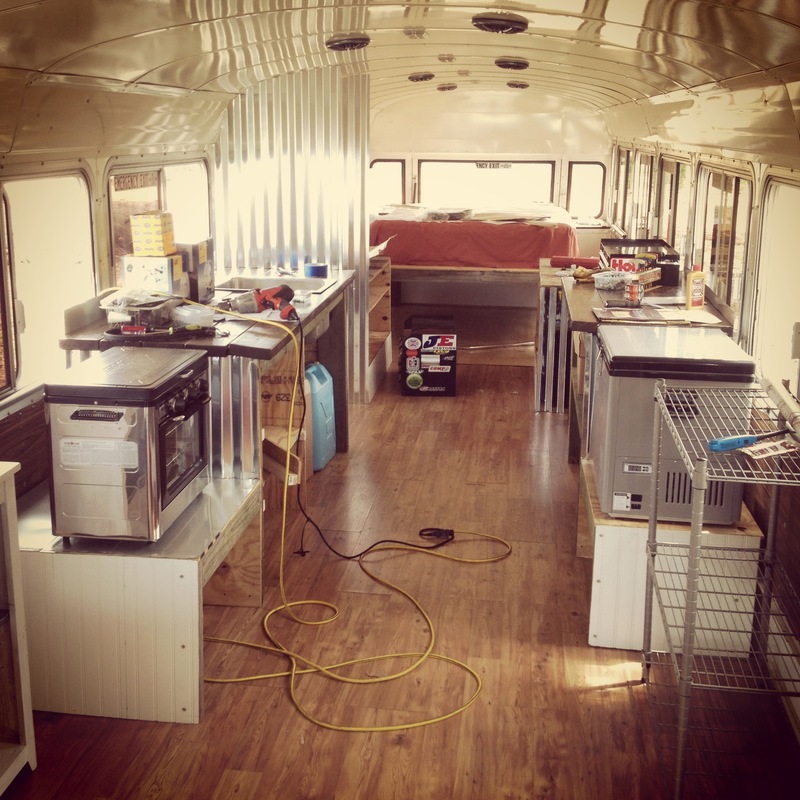 Took a peek at your blog, looks like we might be able to learn some things from you! The Dry Flush has been great except that we have only been able to get about 5 uses out of it, instead of the 15 per liner. I’m still waiting to hear back from the company, but I’ll let you know what I find out. Seems to be an issue with the little motor inside. If you make it out to Oregon this fall look us up! Im am soooooo impressed. I’m in the works of doing something similar with a Tastykake truck. Please check out my page on Facebook OTGLiving. I was stoked to find your toilet ! 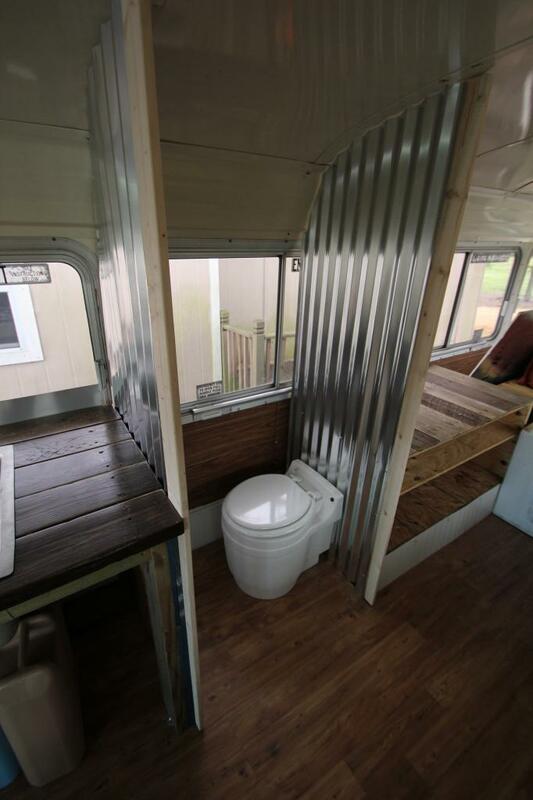 I was torn between a composting toilet, a 2.5 gal rv toilet and an incinerator toilet. Never heard of the dry flush so I’m definitely gonna check that one out! Your home looks great. When I’m done mine we’ll have to meet up somewhere. That sounds like an awesome project, we will have to check it out! Just gorgeous, great job! I know it can’t really matter, but what kind of gas mileage do you get, and do you have to have a special driver’s license? Thank you! We get anywhere between 7 and 10.5 MPG, depending on terrain and speed. 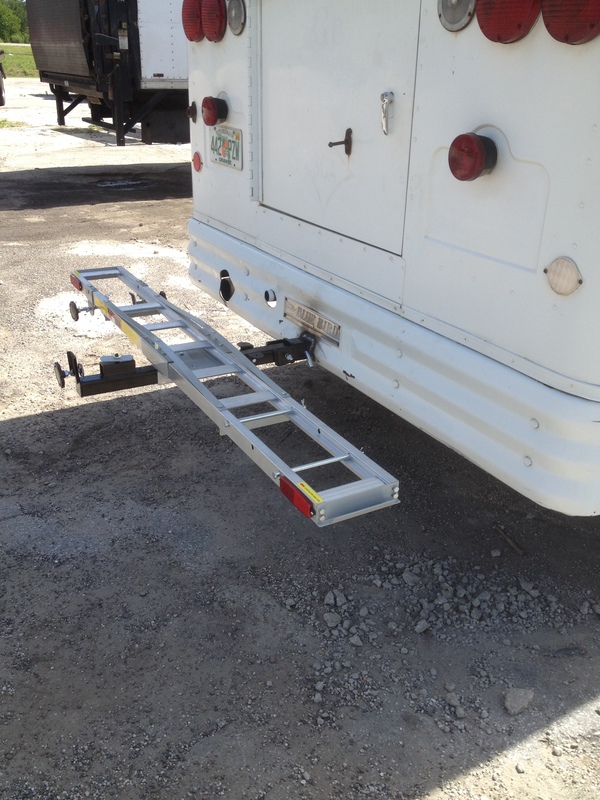 I don’t need a special license since we changed the title from a bus to a motorhome. I cannot believe you got the conversion done in less than five months. That is AMAZING! 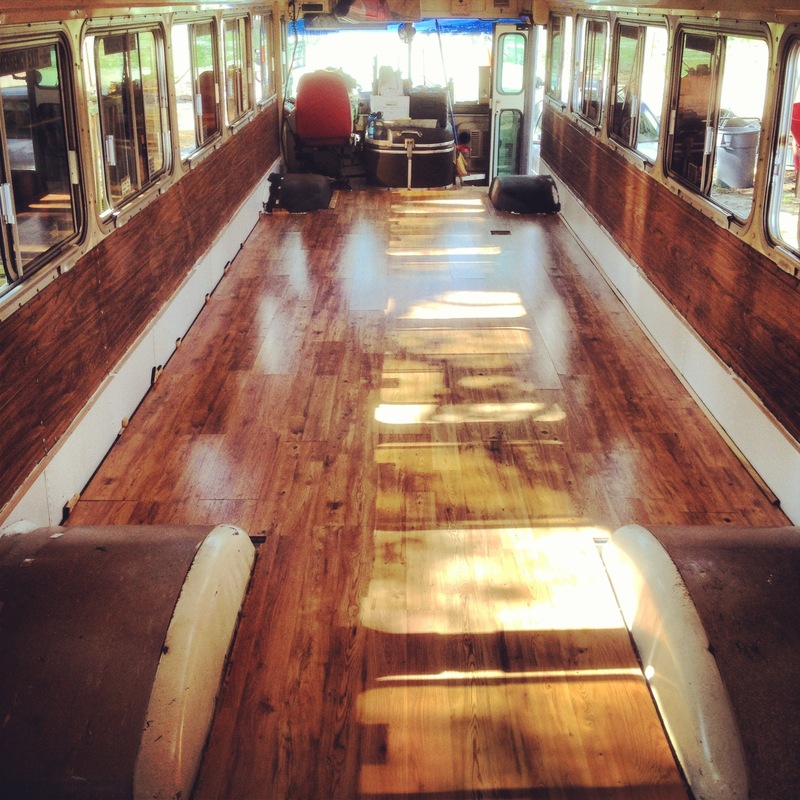 Do you have any sage advice for those of us wanting to go the same “route” with a bus of our own? It was a lot of hard work, but we were very motivated by our rental lease expiring. Tearing up the old floor was one of the hardest parts of the project. I would suggest having a much of the layout planned a head of time as you can, and also looking for the perfect bus to begin the project with. 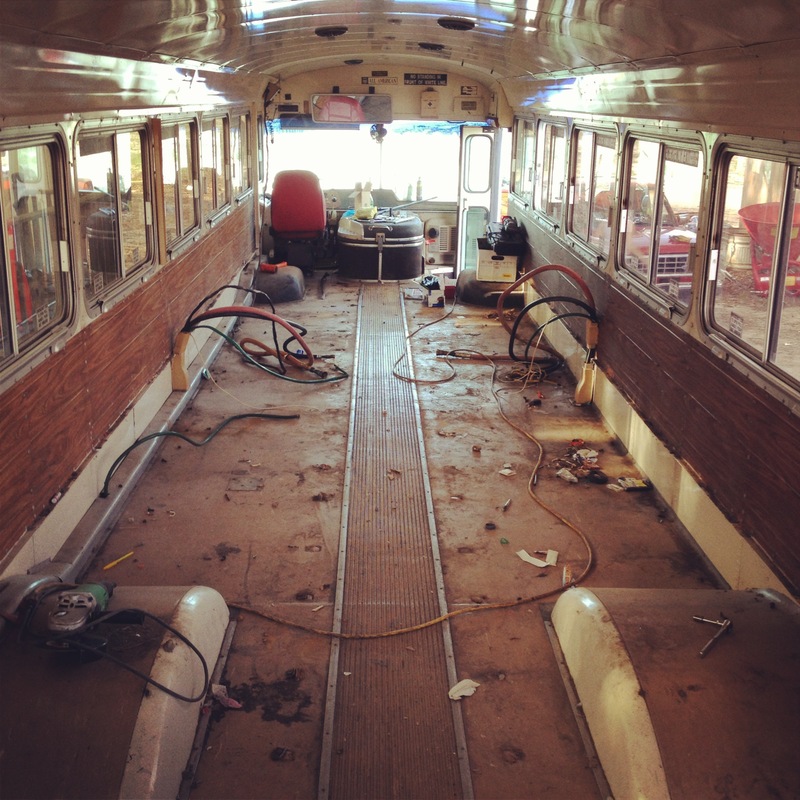 Once you go through the effort of rebuilding it you won’t want to have to switch buses any time soon! I would also recommend getting your solar setup right the first time (if you are doing solar). 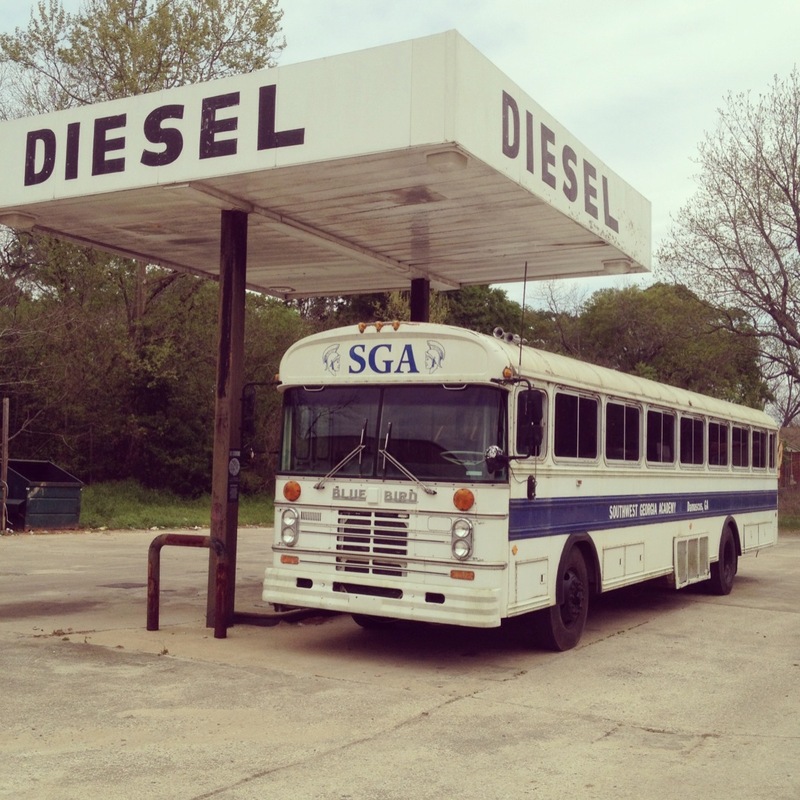 Ours is underpowered, and it is one of the things I dislike most about our bus. Hi! I love your bus. 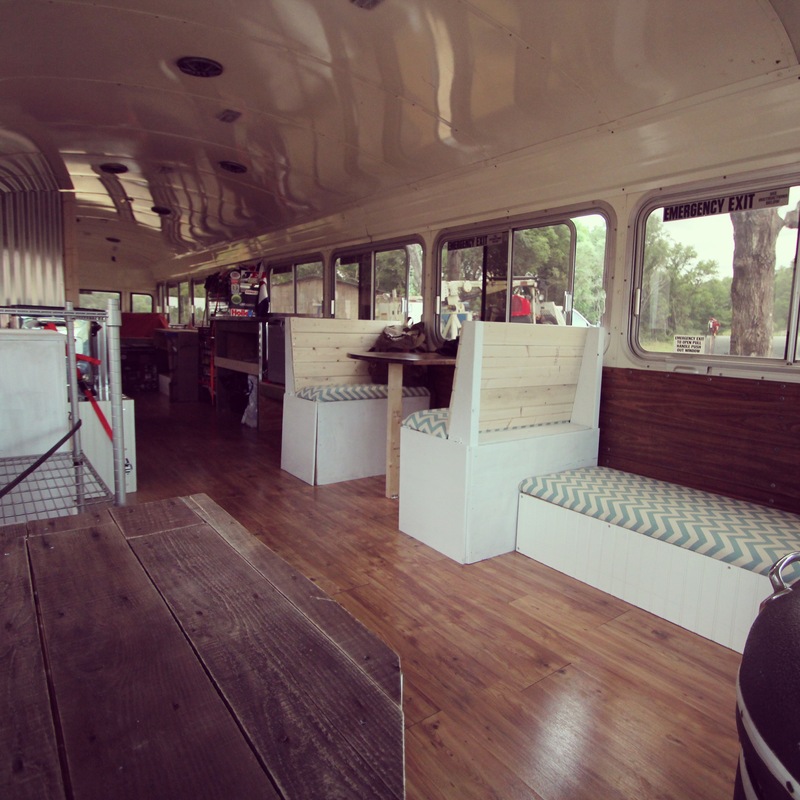 My boyfriend and I recently purchased an already-renovated Blue Bird bus. It needs a little work and some things added such as a toilet. I am interested in learning more about the Dry Flush. Do you guys have a shower on the bus or did you find places to shower along the way? 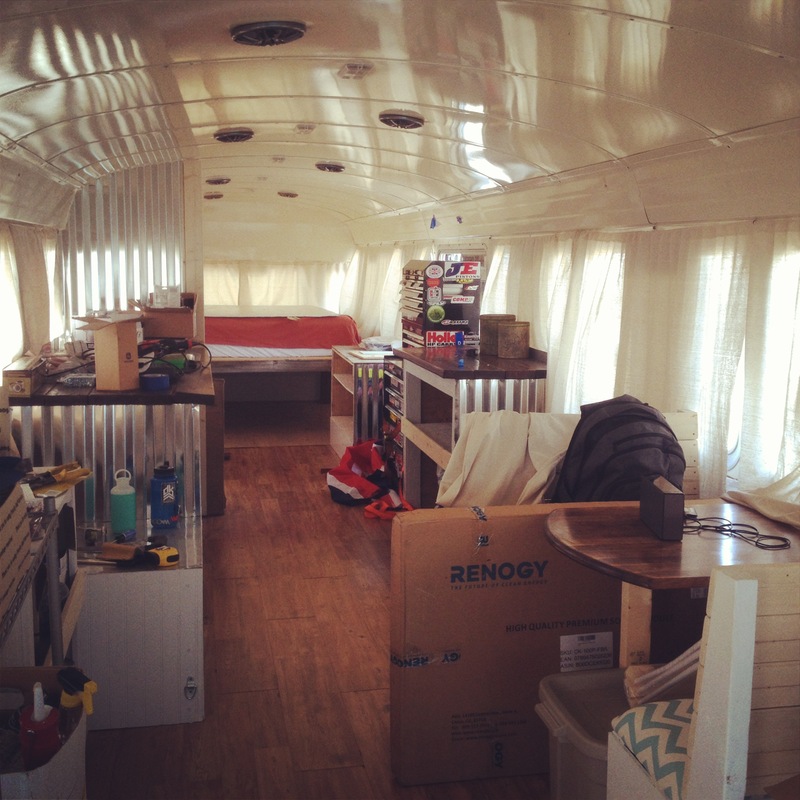 Also, do you live in the bus in Oregon or do you also have a home there? Great conversion! 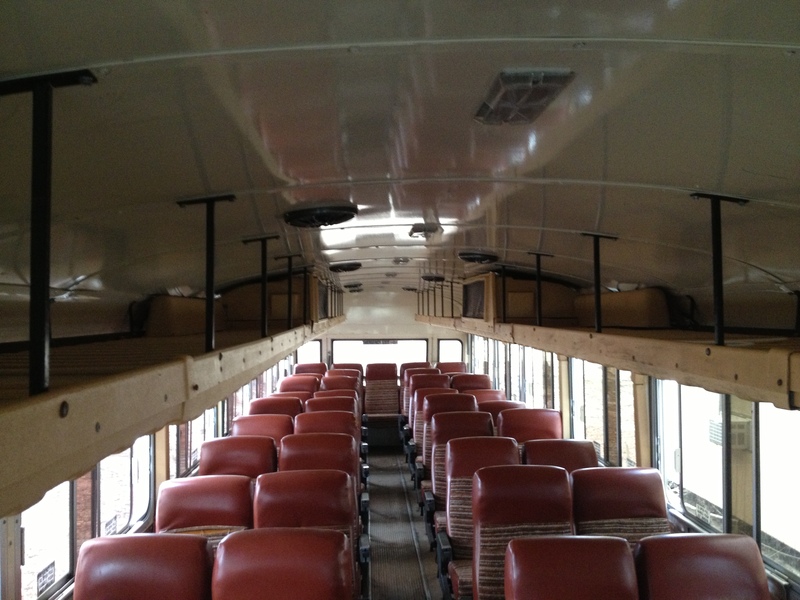 What did you do with the air conditioning system and the luggage racks in the bus? 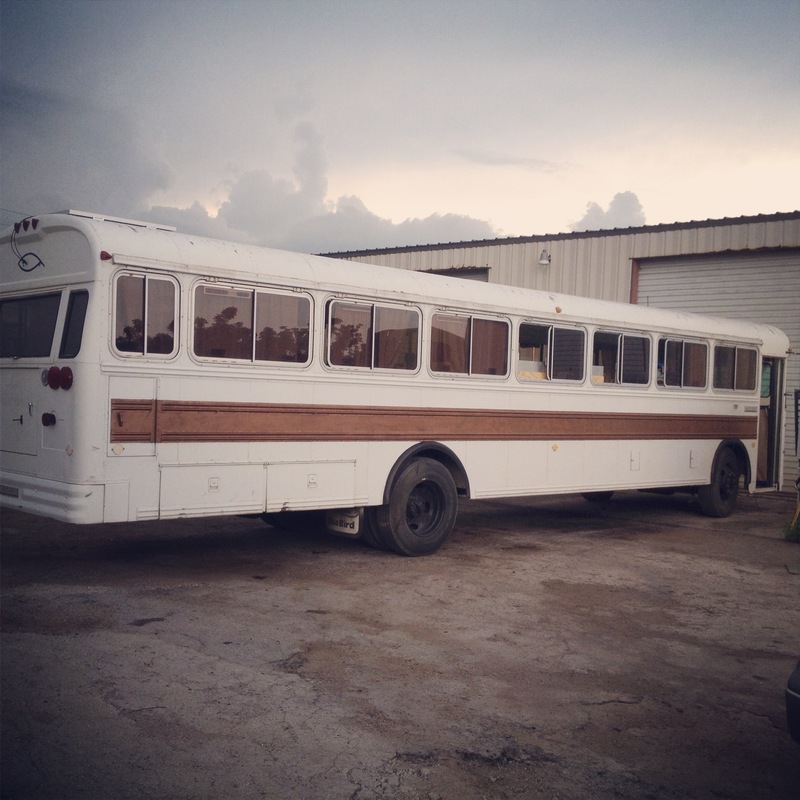 I’m starting to convert a similar bus and am wondering whether to try to sell them or just rip them out and trash them. Hey James, we thought about that too, but ended up just scrapping everything we ripped out. Our system was so outdated though, I doubt it would have been of use to anyone else. If you are working with a newer bus and it has a nice, self contained Carrier system it would probably be worth saving and trying to sell on craigslist, or maybe one of the bus conversion forums. Good luck with your project! I have the same stove in my camper, But they told me I could only use the little tanks on it . I would like the bigger ones better. And where did you find the foot operated galley pump I need to get to get one of those. It look great! Thanks for the information. I think I will do the same thing. 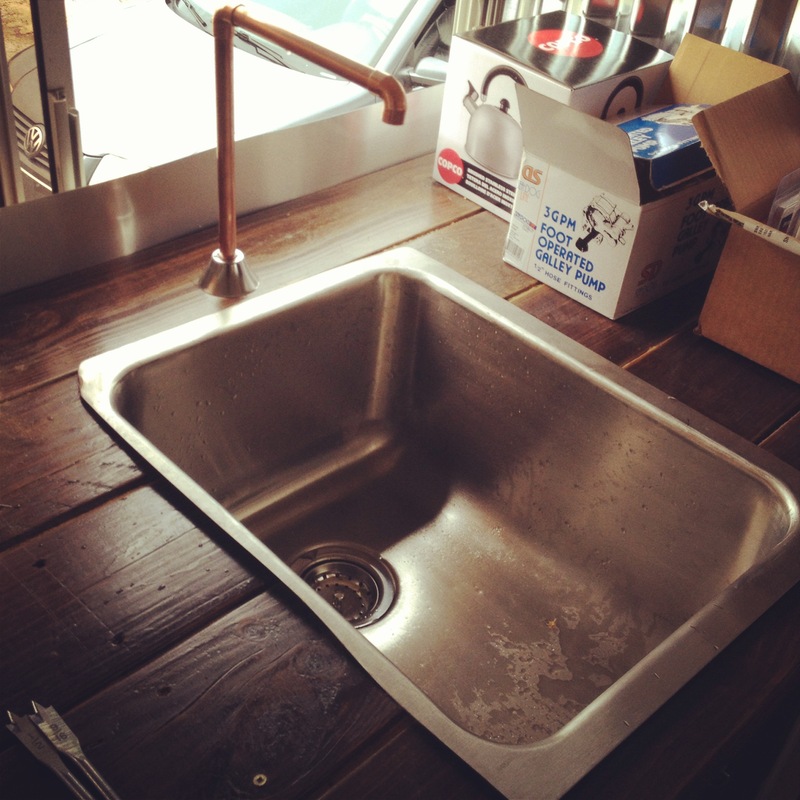 I love your copper faucet. Is it controlled by the foot pump in the box shown in the pic? Or did you install something else? I wanted to do something like this for our bathroom but ended up using a hose bib, though I am not crazy about it and would like to simplify it. You guys did an incredible job! We are about to finish construction on our 2002 Bluebird in Northern Michigan. It would be cool to organize a “schoolie” meet-up sometime! Anyway- live your journey & follow ours too: Facebook.com/TheBodegaBus. Ours will be done in 3 weeks!! !